another one opens, and it turns out that behind every door is a top waiting to be quilted. Next in the quilting queue was All at Sea, which was nicely backed and basted and ready to go as soon as I finished the denim circles. Not much more to say about it yet, but here's a picture. As usual, I'm sharing this for Slow Sunday Stitching at Kathy's Quilts. I have several quilts waiting to be quilted...they are in plastic bins, ready to go. I just need some time. I hope you show a picture of the entire quilt soon. The part you have shown today is just a tease! OH this will be so fun to quilt! Enjoy every stitch! I only have one quilt waiting to be quilted. It is queen-sized so it needs to go to the long-arm quilter that I use. Enjoy your quilting. Gosh, your quilting stitch is beautiful on this Kaja! It seems to me that it's really become very refined lately. What do you think? I love your open door statement. There are always more quilt tops waiting their turn. The quilting on this one is just perfect. I like the colors and your hand quilting is lovely. This is one I love. There are loads of lighthouses on the west coast. I will have to document them on a quilt, too, some day. Your stitches are so pretty! I'm looking forward to seeing more of this quilt. 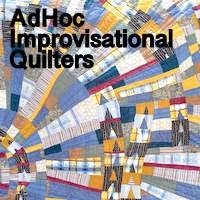 I truly love this quilt - looking forward to seeing how you proceed with the quilting. The quilting is going to add such nice texture to this one! No rest for you! You are going to have to change the name of your blog from Sew Slowly to Sew at the speed of light! I recognize that blue polka dot fabric. I had bought many pieces in that line of fabric. It adds such a fun touch to your quilt. Well, I'm certainly on Slow Sunday time by only just getting around to reading this post! I do enjoy watching your quilting progress and this quilt is no exception. Oh, good! The lighthouses have made an appearance!